(2) the car was moving. 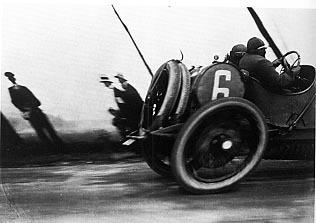 The photograph was taken during the 1912 French Grand Prix by Jacques-Henri Lartigues. Most modern cameras use a diaphragm shutter just behind the lens. A small diaphram opens up and then shuts exposing the film for just the right amount of time. Lartigues's camera, however, used a focal-plane shutter. It consisted of a narrow slit in an opaque sheet. The sheet was placed just atop the film in the "focal plane" of the camera and was drawn over the film rapidly. As the opaque sheet moved the slit exposed different portions of the image as it traveled across the film. This explains the elliptical appearance of the circular wheel. The bottom part of the picture was exposed first. By the time the slit reached the part of the image with the top part of the wheel the car had already moved slightly forward. In fact we can tell by the way the people and poles in the background tilt to the right that Lartigues moved the camera ("panning") to try and follow the car. The bottom of the people were exposed first and the top of the people were exposed after the camera had moved. This is exactly what happens in Special Relativity. Differing measurements of simultaneity lead to different measurements in the lengths of things. It all depends on which frame the measurements are taken in. In fact if the camera had been tilted 90 degrees so that the front of the car was exposed first and the rear part of the car exposed later then the photo would show a "length-contracted" car. Exactly what happens in relativistic length contraction. Notice how since (1) the car was moving and (2) the film was exposed with a focal-plane shutter that the image of the car is shorter than the car. Again a differing interpretation of "simultaneous" makes the image of the car contracted exactly as happens in relativity. Suppose there were large clocks on the front of the car reading time in hundredths of a second. Suppose also that the clocks were perfectly synchronized on the car. Then in the photograph the front clock will show less time ("be behind") than the rear clock simply because it was exposed onto the film first. Again this is what happens in SR. If two clocks are synchronized in an inertial frame in which they are at rest then when they are observed from a frame in which they are moving the front clock will be behind the rear clock. In fact, we can use the concept of the FOCAL-PLANE SHUTTER to make a model of what happens in SR.